Losing weight is no easy task, and many Americans seek quick, easy solutions for meeting weight loss goals. While coconut oil once had a bad reputation due to its high saturated fat content, new research shows it may not be as bad for you as once thought and could even provide you with several health benefits. But because coconut oil is high in calories, you may be left wondering if it's really beneficial when you're trying to shed pounds. Several studies do show including coconut oil in your weight loss plan is beneficial. One such study published in 2008 in The American Journal of Clinical Nutrition found consuming oils high in medium-chained triglycerides (MCTs), such as coconut oil, over olive oil leads to greater weight loss in overweight men and women. Another study published in 2008 in the Journal of the American College of Nutrition also found that participants enrolled in weight-loss programs lost more weight when consuming medium-chained triglyceride oil versus olive oil. Coconut oil appears to aid in fat loss in addition to weight loss, according to several studies. The 2008 study published in The American Journal of Clinical Nutrition reports that medium chain triglyceride oil resulted in greater trunk, total, and intraabdominal fat loss than olive oil. 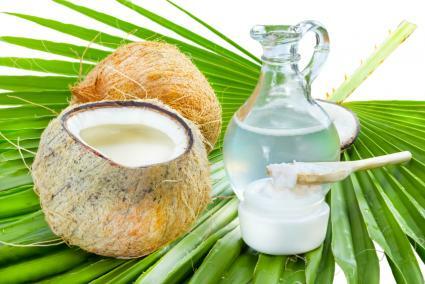 A 2009 study published in the journal Lipids found that coconut oil helped reduce waist circumference in women with abdominal obesity, and a 2011 study published in ISRN Pharmacology showed that virgin coconut oil reduced waist circumference in obese men. It may seem counterintuitive that coconut oil would aid in weight and fat loss because it is high in calories and saturated fat. However, the medium-chained triglycerides found in coconut oil appear to help boost your body's energy expenditure, according to the 2008 studies in The American Journal of Clinical Nutrition and the Journal of the American College of Nutrition. Keep in mind that study subjects who lost weight and body fat using coconut or medium chain triglyceride oils were following calorie-restricted weight loss plans. There isn't an official dosage recommendation for coconut oil due to lack of sufficient scientific information, according to MedlinePlus. However, the 2008 study in the Journal of the American College of Nutrition used dosages of 18 grams daily for women and 24 grams of MCT oil per day for men, which was about 12 percent of daily caloric intake recommendations. The study published in The American Journal of Clinical Nutrition also used daily dosages of 18 to 24 grams of MCT oil per day. The studies in Lipids and ISRN Pharmacology both used dosages of 30 milliliters, which is just under 30 grams, of coconut oil daily. Adding coconut oil to a reduced-calorie weight loss plan appears to enhance weight and fat loss when taken in certain dosages according to scientific research. One reason for this is medium-chain triglycerides found in coconut oil appear to boost energy expenditure. However, ingesting coconut oil isn't a guarantee you'll lose weight -- your total calorie intake must be less than the number of calories your body burns.